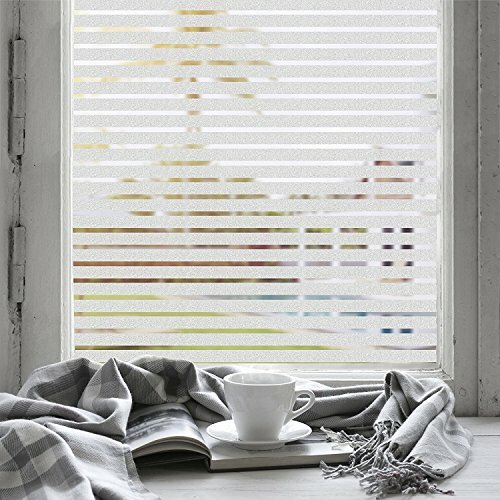 A luxurious alternative to expensive window treatments, EaseOnSource Decorative Privacy Window Films are both beautiful and cost-effective. It's made of eco-friendly PVC material, designed to be completely waterproof and Fastness, they won't block natural light or hide window frames like drapes, shades or sheers also provide much more privacy. it's the perfect choice for kitchen, bedroom, bathroom, living room, dining room, office, hotels, classroom. The Window films are easily applied to any smooth glass surface. Size: 35.4 x 78.7 inch. Function: Waterproof, Fastness, block out more than 95% of harmful UV rays, privacy protection, decoration. Recycled Utilization: Static cling without glue and reusable. Long Life Span: In normal condition, it will last for 5-8 years on the window or door glass. Warranty: Limited 1 Year Seller and Manufacturer's Warranty. Step 1. Measure and cut film according to the size of your window frame. Step 2. Clean window glass. Step 3. Spray water or Soapy water on the glass surface. Step 4. Remove the static film from backing covering sheet ( Please make sure you have removed it before you apply the window film to glass). Step 5. Apply the static film to wet glass and smooth with hands. Step 6. Squeegee away water and air bubbles with a scraper or bank card. - if window film can not stay on the glass or remains too much bubbles, pls spray a lot of water and make sure u have apply the correct side of the film. - If you want to remove it, simply peel the window film from any corner. It comes off cleanly leaving no residue. 1 roll of window film. --PRIVACY WINDOW FILM: The frosted surface of the window film reduces glare and provides privacy unwanted viewing. --NON-ADHESIVES GLASS FILM: DIY with water, static cling, very easy to install. --UV BLOCKING WINDOW STICKERS: Control heat and block out more than 95% of UV rays, to prevent floor, curtain, carpet, furniture, art and many fabrics fade aging. --REMOVABLE & REUSABLE: Easy to peel off, removable without leaving any residue, provide environmental protection. --APPLICATION: Suitable for doors and windows, shower door, bathroom, living room, kitchen room, dining room, bedroom, glass door, office, meeting room and classroom. If you have any questions about this product by EaseOnSource, contact us by completing and submitting the form below. If you are looking for a specif part number, please include it with your message.